Stand Up Paddle Surfing: Wooden would paddle. I received a couple of emails about the last race, they got me thinking. Specifically, I wondered why it was that I cared about racing and why the outcome mattered to me. Fortunately, I have somebody to bounce these ideas off of. Ever heard of John Wooden? Of course you have- but if you haven't, let me fill you in. John Wooden was, arguably, the greatest coach in the history of American sports. Until 2004, he was the only person ever inducted into the Basketball Hall of Fame as both player and coach (1961 and 1973). 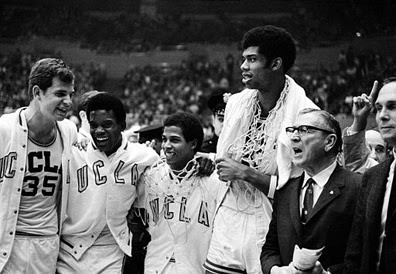 As head coach at UCLA his teams won ten NCAA titles in his last twelve seasons including seven in a row from 1967 to 1973. During his tenure, UCLA went on an 88 game winning streak and had four perfect 30-0 seasons. That's almost three years in a row without losing a game! Do not judge yourself by what you have achieved but rather by what you could and should have achieved given your potential- if you'd never ceased trying to be the best you could be." In the end, it's not where you've placed in the field but, rather, if you worked to your potential. And I've found that to be a much, much more difficult goal to achieve. I'll let you know when I get there. sage advice, brother, just don't overstress in the quest...it's all about balance! I agree with you- balance. If it's not fun- I'm not doing it.